Remus Osan is a scientist who is intrigued by how nature works and who hopes that we (humans) will ultimately be able to obtain knowledge about its inner workings. 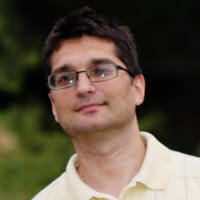 Remus has focused his efforts into building computations models for biological systems (brain networks, heart rhythms, cancer) and into developing new analysis methods for investigations of data sets obtained from experimental investigations of these systems. He thoroughly enjoys the puzzles posed by new datasets and he is excited to share his insights and approaches with students. More importantly, he is looking forward to learning more during this process. Remus has graduated from University of Pittsburgh where he has received a PhD in Physics and an MS in Computer Science. He has also enjoyed additional learning experiences at Princeton University and Boston University as a postdoc, and he was happy to serve in a mentoring role at Georgia State University as an Assistant Professor. In recognition of his exemplary service in the classroom, Remus has been selected as a member of General Assembly's Distinguished Faculty program.